Everything you ever wanted to know about shooting video in Cleveland. Prior to arriving in a new city, every producer needs the lay of the land. This guide explores everything about Cleveland, OH that producers need to know. Cleveland is a city evolved from a manufacturing hub into a mecca of art and culture and fun people. Located right on the edge of Lake Erie, Cleveland is a lakeside city with attractions like sailing and (in the warmer months) sunbathing. No matter the season, Cleveland has plenty of activities, new restaurants, and events to explore. Travel and Leisure lists the Cleveland Museum of Art to be one of the must-see attractions of the city. With rotating artists and exhibitions, there is always something new to see, and admission is always free. When in Cleveland, rock like the Clevelanders do. Cleveland is the first place to have coined and used the phrase “Rock and Roll” and is now home to the Rock and Roll Hall of Fame, a fact locals are very proud of. The Hall of Fame hosts concerts and screenings of rock and roll legends like Chuck Berry, Aretha Franklin, and Ray Charles. Rock on! On clear days, Canada can be seen from the shores of Cleveland. There aren’t currently any ferries to take a quick trip to visit our northern neighbors, but you can rent a boat and check out the famous islands located in the middle of Lake Erie. Sailing is a popular activity for Clevelanders, but be sure to go in the summer when it’s not too cold and the lake isn’t frozen over. Cleveland also attracts some of the healthcare industry’s best future doctors and nurses. The Cleveland Clinic has one of the best rated academic medical programs in the country and consistently rated one of the best hospitals in the country for quality of care and multi-specialty prestige. If you’re in need of a breath of fresh air, Cleveland is your city. Often referred to as the “Emerald Necklace” Cleveland is surrounded by a ring of lush, dense nature reservations that are great for year-long activities. Visit the zoo located in the parks, bike on one of the trails, go hiking, or visit one of their five nature centers. The Metroparks is a great way to connect with nature and escape the rush of the city for a while. Want to do something truly unique to Cleveland? Visit the West Side Market that has been operating since 1840. Prepare to be overwhelmed by the number of local stall owners selling homemade pasta, bread, meats, and hot food. There’s a variety of cultures represented so you’ll have a lot of options to try. We recommend going for lunch and stocking up on as many fun dishes as you can fit. Want to catch a game while you’re in town? Check out their NBA team the Cleveland Cavaliers, their NFL team the Cleveland Browns and their MLB team the Cleveland Indians. Cleveland provides many opportunities for higher education at Cleveland State University, the Cleveland Institute of Art, and the Cuyahoga Community College. Travel and Leisure offers a few great options for hotels downtown, depending on what you’re looking for. They list the best luxury hotel in the city as the Ritz-Carlton that boasts gorgeous views of the lake. For something more uniquely Cleveland, Travel and Leisure recommends either the Kimpton Schofield or the Metropolitan at the 9. Both hotels feature modern and art influenced designs with a more affordable price tag. 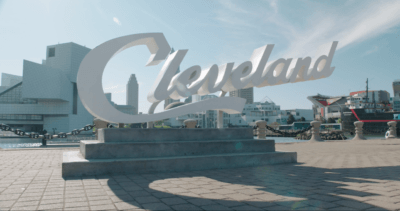 Like most cities, Cleveland offers a number of budget-friendly options located all around the city such as the Holiday Inn or Hilton Garden Inn. If you need to be located close to the Cleveland Hopkins International Airport, there are many airport hotels such as the Radisson Hotel, Holiday Inn Express, and the Four Points by Sheraton. Commutes in Cleveland are known for not being too bad, with the average commute time being just under 25 minutes. If you plan on driving downtown, you won’t have to worry about too much traffic and there are plenty of parking garages to find a spot. During rush hour, we’d recommend leaving yourself an additional 10-15 minutes just to be safe if you plan on taking I-77, but most of the time traffic shouldn’t be too rough. From most areas in greater Cleveland, drives to and from downtown are usually no longer than 20-30 minutes. Drive times to the airport are around 20-25 minutes when taking I-71 or I-77 from downtown. Public transportation in Cleveland is great compared to some other cities. There are four train lines (called Rapids in Cleveland) and various bus routes that will get you to most major locations around the city. Ticket options include single rides, multiple ride passes, and full day passes. There are also a number of free hop-on-hop-off trolleys that stop at a lot of the popular tourist locations. Wait times can sometimes be 20 minutes or more though so it might be worth it to walk since most major attractions are within walking distance of 15-20 minutes. Commutes using public transportation aren’t that bad either, but as usual, we recommend giving yourself some extra time during rush hour. Cleveland winters are cold and brutal, with every possibility of it dropping below zero and staying in the single digits during the day. Snow in Cleveland is a non-affair. Workplaces don’t shut down, people still walk around town, and the cold seems to not affect locals. Temperatures can change fast and go from single digits to 40’s in less than 24 hours. To anyone not from a northern state used to the cold, we recommend layers and lots of them. Cleveland summers are warm and humid, usually hitting highs in the 70’s and low 80’s in July and August. For a current forecast in Cleveland, click HERE. Crews across the country have a set of guidelines by which they conduct business. And as different as each city is from another, so are those guidelines. Every producer should have a basic understanding of each city’s standards. Shoots in Cleveland are based on a ten hour day and the crew is on the clock at the specified crew call. Overtime at a rate of time and a half begins after ten hours. If your shoot takes the crew to a distant location, travel time can be expected. A distant location is any location outside a circle with a 30-mile radius drawn around the city. But all of these are just guidelines; certainly, verify with your crew their specific policies. For any additional questions about Cleveland, check out their Visitors Bureau below.